​Kiev is trying to invalidate the plan of heavy weaponry withdrawal from the demarcation line in eastern Ukraine, thus undermining the Minsk peace deal, Donbass officials claim. An OSCE top official says Kiev is not pulling away its artillery. 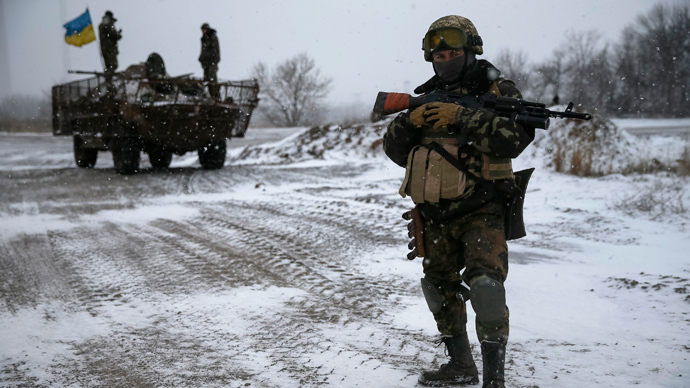 The Organization of Security and Co-operation in Europe (OSCE), which has a monitoring mission in the conflict area, said Kiev has so far failed to begin moving its weapons from the demarcation line. “Ukrainian military forces keep silent for the moment being. They don’t pull out their heavy weaponry and say that a pause is needed. That is what really triggers certain concern of the OSCE, as this pause may last indefinitely,” said the Russian ambassador to the organization, Andrey Kelin. Kiev selectively follows the Minsk deal, a spokesman for the self-proclaimed Donetsk People's Republic, Andrey Purgin, told Rossyia 24 TV channel on Wednesday. Representatives of the International Committee of the Red Cross and the UN humanitarian mission in Donbass are trying to achieve the cancelation of Kiev’s “blockade” of the eastern regions, he added. Pushilin and Deynego also expressed hope that Ukraine will comply with the signed document and start the pull-back of artillery. The Russian ambassador to the OSCE, Andrey Kelin, added that Kiev has not yet given a promise to draw back its artillery. On the other hand, it has been more than two days since the militia said they are ready "to grant access for the mission to the locations where guarded weapons would be stored,” he said. The president of the Parliamentary Assembly of the OSCE, Ilkka Kanerva, said the rebels have denied “unlimited access” in eastern Ukraine to the OSCE’s monitoring mission. In turn, the militia said they have sent an inventory to the OSCE – and that the observers are rejecting invitations to witness the actual movements of the weapons. “We believe the OSCE's role is crucial. Once again, we confirm that we are interested in OSCE presence at all weapons-withdrawal events. The OSCE must be present to monitor the withdrawal of the weapons by both sides," rebel spokesman Eduard Basurin said on Wednesday. He also noted that the humanitarian situation in Donbass has worsened since the ceasefire started and that the region is “close to a catastrophe,” as Kiev has imposed a blockade. The members of the Trilateral Contact Group – Ukraine, Russia, and the OSCE – have seen a decrease in the intensity of heavy shelling, according to the press secretary of Ukraine’s ex-president, Leonid Kuchma, who represents Kiev in the peace negotiations. Peace in Ukraine is “fragile” but it’s in place, said the OSCE's chairperson, Serbian Foreign Minister Ivica Dacic, while speaking at a Helsinki Commission hearing at US Congress on Wednesday. Following the agreement for weapons withdrawal, Ukraine continued appealing to other countries for more weapons. Also, former Georgian President Mikhail Saakashvili – who recently became an adviser to Ukrainian President Poroshenko – is currently on a working trip to Washington, with the mission to persuade the US to supply Kiev with arms. Meanwhile, the US defense undersecretary for policy, Christine Wormuth, said at a Congress hearing on Wednesday that stiffer Russia sanctions might “potentially be more effective and have fewer downsides” than arming Ukraine.